You probably have heard quite a lot about Tagliatelle and Tagliolini without knowing exactly the difference between them. Indeed, both are traditional pastas from Italy. Both are egg pastas – they are made from eggs and flour. However, there are some subtle yet important distinctions that set Tagliatelle vs Tagliolini apart. Find out more about the differences below! Obviously, Tagliatelle originated from Italy. It is a traditional type of pasta that came from Emilia-Romagna and Marche – the same area that now produce Grana Padano vs Parmesan cheeses. The name “Tagliatelle” was formed from the Italian word “tagliare”, which means “to cut”. This is because of the thin, slender shape. Tagliatelle is considered as an egg pasta because it is made from eggs and flour. According to Wikipedia, the ratio between the ingredients is typically one egg for one hundred grams of flour. Just multiply those numbers when you want to make more: two eggs for two hundred grams of flour, or ten eggs for one kilogram of flour. The main difference between Tagliatelle vs Tagliolini is the shape. You can easily distinguish Tagliatelle from the look alone, if you know what to look for. Tagliatelle is long and flat. In a glance, it looks similar to Fettuccine, but it is actually a little bit wider. The typical width is usually between 6.5 mm and 10 mm (0.26 inches – 0.39 inches). In addition, the individual pieces are usually not too thick, in contrast to Fettuccine’s distinctive thickness. Bologna Chamber of Commerce has a solid gold replica of one Tagliatelle piece with perfectly precise dimensions of 1 mm thick and 6 mm wide. Bavette and bavettine are variations of Tagliatelle in shape. If the individual pieces are thin, it is called Bavette. If the individual pieces are even thinner, it is called bavettine. Unlike Tagliolini, Spaghetti, and Capellini, which are sold in long and straight forms, Tagliatelle is sold in nests. The solid individual pieces are somewhat jumbled with each other. Although the nests are often rounded and shaped like bowls, this is not always the case. Some products – mostly the large sized packs – have abstract forms. Tagliatelle is an absorbent pasta with a porous and rough surface. As the effect, it can keep a firm texture after cooking. It is an ideal choice when you want to use a heavy, meaty sauce like the bolognese sauce. However, Tagliatelle is practically suitable with a wide range of sauces.Tagliatelle is also often used for meaty dishes that contain beef, rabbit, pork, or veal. Although this is less common, Tagliatelle may also be used for less rich dishes and vegetarian dishes. Some notable examples are pomodoro e basilico (served with tomatoes and basil), uovo e formaggio (served with eggs and cheese, but not as rich as carbonara), and briciole e noci (served with breadcrumbs and nuts). Although Tagliolini is known as a variety of Tagliatelle, this Italian pasta was first made in a particular area. Tagliolini is a traditional recipe from the Liguria region – more specifically, Piedmont and Molise. The name “Tagliolini” also came from the same Italian word “tagliare” which means “to cut”. However, it has its own name in the Piedmont area, which is Tajarin. It has become a popular dish that is served in many variations in Rome. Tagliolini is very similar to Tagliatelle in terms of flavor and texture because it is made from the same ingredients. It is also an egg pasta, made from eggs and flour. It is also considered as a ribbon pasta because of the long, cylindrical shape. Although this pasta is served in many dish variations, the pasta itself doesn’t have any other variant. As mentioned above, the main difference between Tagliatelle vs Tagliolini is the shape. 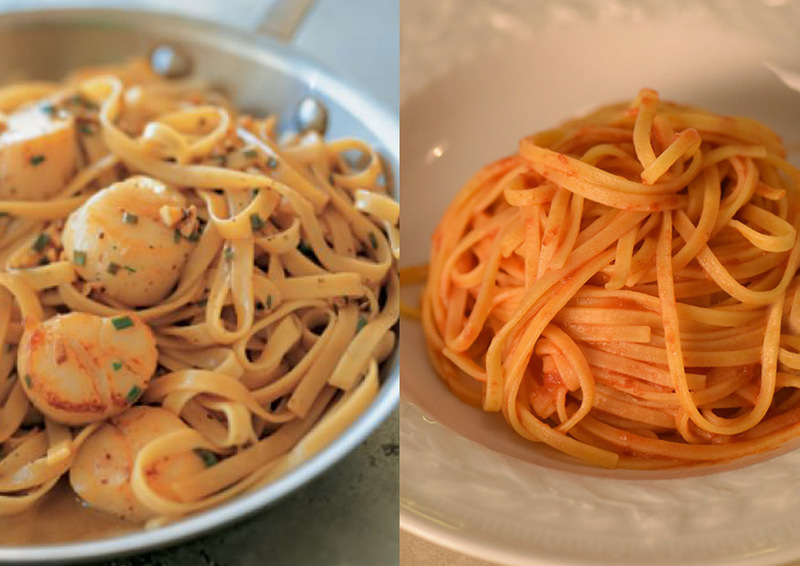 So, if you know how Tagliolini is supposed to look, you can easily distinguish the two kinds of pasta apart. Tagliolini is long and cylindrical. The diameter is typically between 2 mm and 3 mm, or roughly about one-tenth of an inch. Indeed, it is really thin if compared to Tagliatelle’s flat individual pieces. However, it is not as thin as Capellini, which is an incredibly thin Italian pasta. Just like Spaghetti and Capellini, Tagliolini is sold in long, straight, solid forms. The individual pieces have the same length. It is very rare for Tagliolini to be sold in nests. Be careful when opening a bag of Tagliolini because the individual pieces may fall down and cause a mess. Due to the thin cylindrical shape, Tagliolini tends to finish within a short cooking time, especially if the dough is fresh. The most typical ways of serving Tagliolini is with truffles and butter (tajarin ai tartufi), or with a meat roast sauce (tagliolini con il sugo d’arrosto). There are several popular variations, such as tagliolini ai limone (served with lemon) and tagliolini alle verdure (served with vegetables). 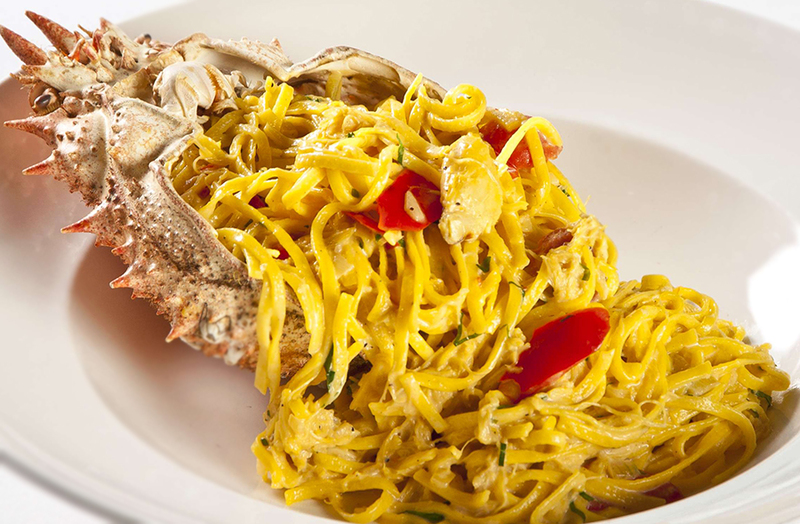 Other variations that are actually similar to the usual preparation but named after the local areas are tagliolini di Campobasso (the town of Campobasso)and tajarin albesi(the town of Alba). Tagliolini is not very porous and is rather smooth. As the effect, it works best with sauces that are thin and light. However, this pasta is also versatile enough to be able to fit with richer sauces, such as the carbonara sauce and other sauces with creamy ricotta. Tagliatelle and Tagliolini are Italian egg pastas. 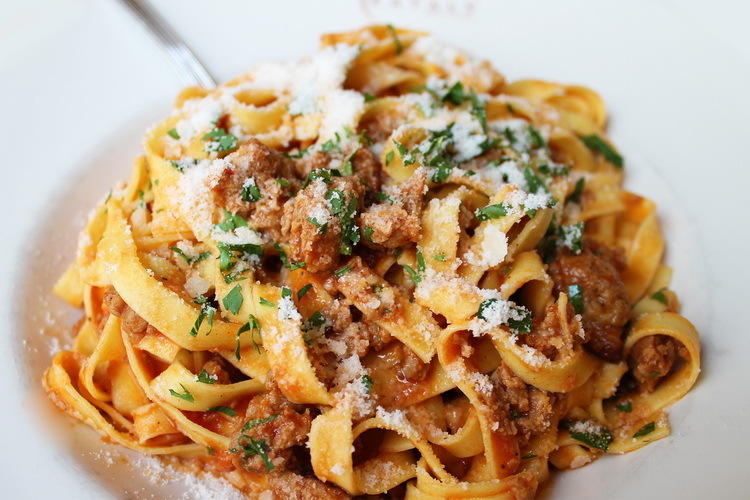 The difference is that Tagliatelle has a flat, wide shape, and is best with heavy and meaty sauces. Tagliolini has a thin, cylindrical shape, and is best with thin and light sauces. Nevertheless, both pastas are actually quite versatile and can work well with many sauces.